Expires: February 16, 1962 Total Premium: $233.19 Property: Homeowners "B" policy Paid for by my #1670 of 7 March 1959 [JAVA? J. A. Van Allen?] 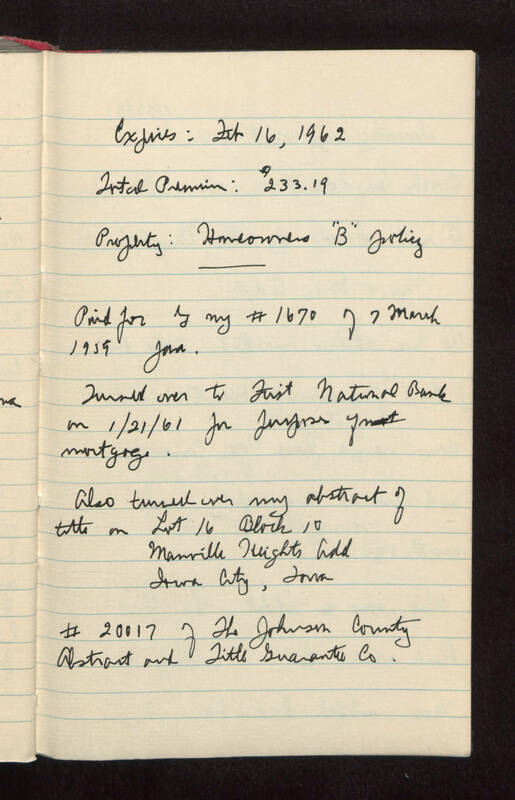 Turned over to First National Bank on 1/21/61 for purpose of mortgage. Also turned over my abstract of title on Lot 16 Block 10 Manville Heights Addition Iowa City, Iowa #20017 of The Johnson County Abstract and Title Guarantee Co.